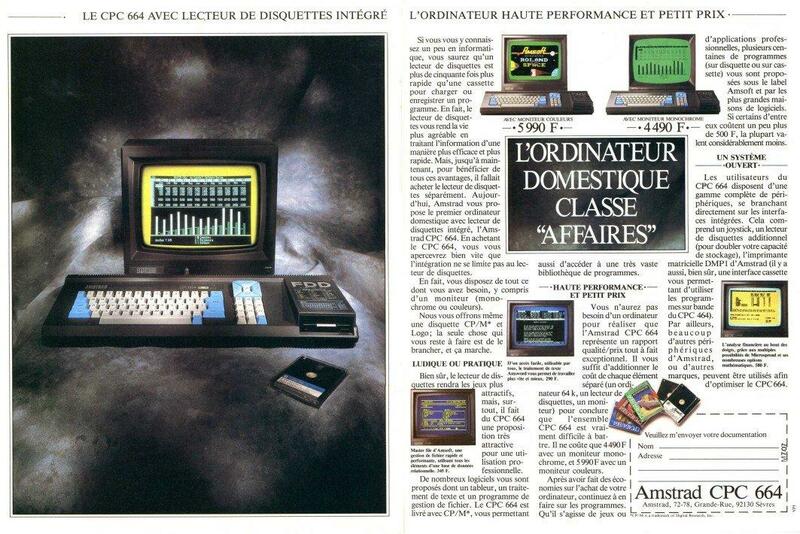 Amstrad's new computer reflects a perceived demand for an affordable, disc-based machine. 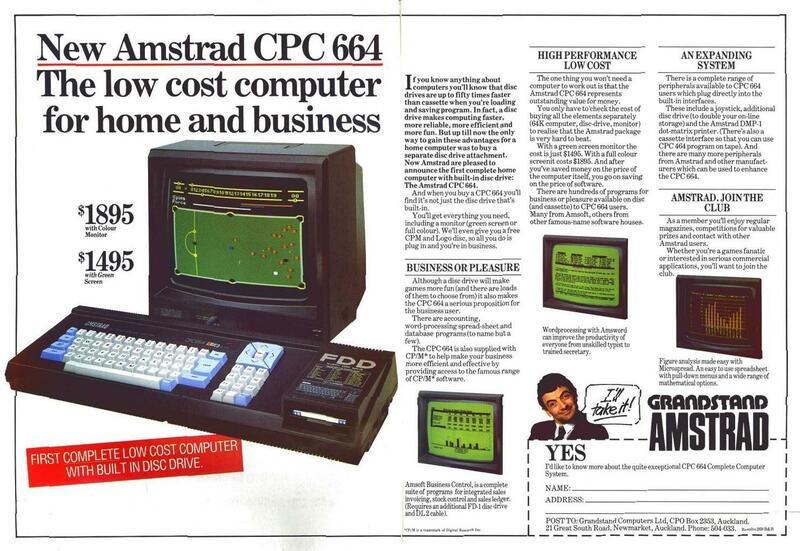 For £339 you get a computer, disc drive and monochrome monitor that is suitable for running many CP/M programs, with the added advantage that a sizeable user base has already been built up by its predecessor, the CPC464. An extra £110 - £449 - will provide you with a version with a colour monitor, although this is not so good for displaying the 80-column text mode. A complete, practical wordprocessing system can now be bought for well under £600. 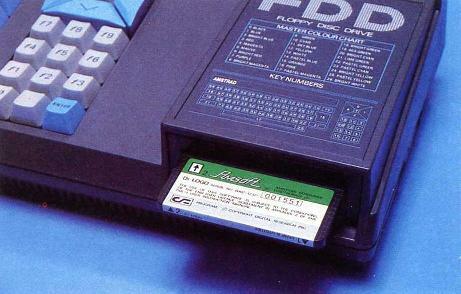 The CPC664 is almost a 464 with a built-in 3-inch drive fractionally larger, with a change of colour scheme, dished keyboard and bigger cursor keys. 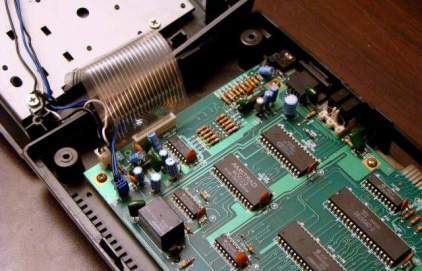 Apart from the cosmetic changes, the hardware has the same specification as the 464 except the floppy disc controlling circuitry has been included on the main board and the 664 requires an additional 12 volt supply for the disc, provided from the monitor. Amstrad has not followed Sinclair's mistake of omitting a cassette interface from their new machine. A Din socket is located on the back which conforms to the standard pattern for audio cassette players, including a remote start facility. Two extra connections are provided -the 12 volt input is a flying lead fitted with a plug, and a second disc drive (£159) can be plugged in. 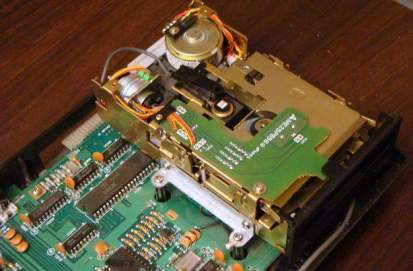 Other connections are the same as for the 464 - expansion (which is not now needed for the disc interface) and printer sockets are circuit-board edge connectors. Only one joystick port is provided (a special joystick is required to allow two sticks), as are 5V DC, monitor and stereo sound sockets. On the software side, there is both good and bad news. The bad news is only bad for 464 owners and software writers who ignored the Amsoft warnings about using the operating system properly. The good news is that, while still retaining a 16K Rom, the Basic has been given a small number of useful enhancements. A Fill command and the ability to draw dotted lines by using a Mask command are the most notable new graphic commands. Also there is an additional parameter for Draw and its related commands that allows you to control the plotting mode, Coring, Ancfing or Oring the new pixels with the old screen contents. Auto has been enhanced, making it harder accidentally to overwrite old lines of Basic. Dec$ has finally seen the light of day. This command, left out of the 464 although documented in the Concise Basic Specification, displays numbers using a pre-defined format template. Most of the other additions take advantage of routines already contained in the CPC464 operating system. The best example is CopychrS, which reads the character from the screen. Used by the copy key routine and available from machine-code on the 464, it is now available to Basic programmers. The most trivial example is Frame, which replaces CALL &BD19 by waiting for the next frame fly-back sync pulse. One extra command has been added to interrogate disc errors so that they can be dealt with by the comprehensive error handling system (Derr), but otherwise the disc commands only have one important difference from the add-on 464 DDI-1 disc unit. A couple of months ago, when I finally tracked down a drive for my 464, two disappointments lay in store. An assembly fault meant that the sound output was shorted out which forced me to break the warranty in fixing it and question Amstrad's quality control. The other was realising how clumsy the string parameter passing was for the external disc commands. To erase a file, for example, it is necessary to enter “A$= "filename":|ERA,@A$''. This lack of foresight in the provision of the Resident System Extension routines has been cleared up on the new 664 ROM - ERA, "filename" will now work, although the bar prefix and extra comma still distinguish it as an external command. Locomotive Software has also rewritten the garbage collection routine which speeds it up, but may also have something to do with rumours of a large quantity of variable corrupting user-defined functions. CP/M and Dr Logo are provided in the price of the 664. The CP/M implementstion has the same limitations as the 464. It is supplied with a full set of utility routines and is a 'true' CP/M, unlike XtalDOS on the Einstein. Amstrad are now committed to the 3 inch drive, which they may come to regret. While there is by no means anything wrong with the format, the greater potential of the Sony inch system looks like making that the 'new* standard. The Hitachi format 3 inch discs are not as expensive as they appear - both sides can be used - but at the moment they are difficult to get hold of. If no one else takes them up, the situation may get worse. The bad news that I mentioned earlier is that there are no plans to provide the new Basic and operating system for CPC464 owners, which means a computer that has been available for less than a year already has an air of obsolescence. There should be no problem with machine-code or CP/M, just the extra Basic commands. These could all be simulated on a 464, but it is a pity that adding a disc drive to the 464 doesn't quite create a 664. There is no question that the CPC664 represents tremendous value for money, achieved mainly by bundling items together. It is definitely to be regretted however, that there is no satisfactory way of up-grading the 464 to a full specification 664 by adding a disc unit. Compared to other machines currently available of the same price, the 664 wins hands down, and deserves to do well. If you are in no hurry, though, it may be worth waiting for something with a 16-bit processor to arrive. Table of CPC 464/664 software differences.